BP has lost its bid to reduce the maximum civil fine of $13.7bn (£8.9bn) it could face for its role in the 2010 Gulf of Mexico oil spill. 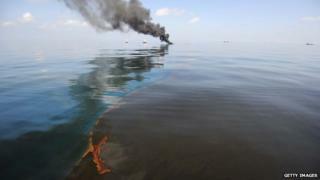 A US judge rejected BP's appeal to pay a cap of $3,000 per barrel under the country's Clean Water Act. Government prosecutors claim the firm is liable to pay $4,300 per barrel spilled to account for inflation. The court has yet to decide the amount of responsibility and final penalty the firm will pay for the disaster. The 2010 explosion on the Deepwater Horizon drilling rig killed 11 workers and caused the largest oil spill in US history. US District Judge Carl Barbier, who issued two previous rulings in the case, had earlier found BP had been grossly negligent leading up to the explosion. According to Reuters, the company disagrees with the court decision and is considering its legal options. BP said it has incurred more than $42bn in liabilities for the spill, which includes the cost of the cleanup, victim compensation and potential fines. In 2012, BP accepted criminal responsibility for the disaster and agreed to pay $4.5bn to the US government, thus settling its criminal liability in the spill.